Monday to Friday: 8:00 a.m. to 4 p.m. The Henry County Chamber of Commerce was founded in 1967 when the decision to build Interstate 75 through Henry County was announced. Entrepreneurial citizens recognized the significant impact and opportunities provided by the construction of a major thoroughfare and took steps to ensure Henry County would be ready. From these visionaries, the Henry County Chamber of Commerce was born. 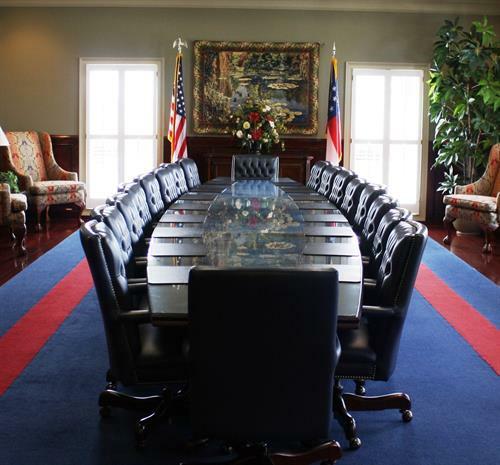 The creation of the Henry County Development Authority and the Water and Sewerage Authority paralleled the development of the Chamber in preparation to provide vital support for the expected growth. Today the Chamber, these entities, and the city and county governments all work closely to continue to plan for future growth. In addition to being a public advocate, the Chamber has worked diligently to maintain and improve Henry County's quality of life. The Chamber has sponsored such programs as the Adopt-a-Road/Adopt-a-Highway program and the Leadership and Youth Leadership Henry Programs. Take I-75 to exit # 218 and go West toward Hampton. Turn left onto Westridge Industrial Pkwy. Take the first right onto Enterprise Pkwy and the entrance will be on the right just after Regions Bank.